Anything to do with feeding the bees. I took the top off one of my hives yesterday and forgot to put it back on before I went to bed. The inner cover was exposed to the elements all night without a protective top cover. And it rained and poured last night. Hopefully it wasn’t a critical goof on my part. I had a German-style feeder over the hole of the inner cover, so it probably kept some of the rain out but not all of it. Hence, the bees are in an extremely bad mood today, pouring out of the hive at the slightest vibration. I saw this happen in the winter once before when a top cover got partially blown off a hive for a few days. Bees exposed to the elements = mean bees. The feeder, by the way, is usually referred to as a Rapid Feeder. That’s what I’ll go with for now on. At any rate, the only difference between the recreated scene in this above photo and what actually happened is that the inner cover was thinner. It’s one of those, well, thinner inner covers that often comes without a top entrance hole notched into it. What I’m saying is, it was even worse than what it looks like in the photo. I haven’t checked on those bees yet because I still want to give them time to chill out a bit before I start messing with them again. UPDATE: I’d like to give this post a new title: Why I May Never Use Anise Oil Again. See further updates at the end of this post. I’ve always added a small drip of anise extract to my sugar syrup. But today I used anise oil instead — an “essential oil,” I assume. A dram of Anise Oil. A little dab will do you. I meant to add only a drop or two, but more than a few drops fell from the bottle when I tipped it. I got some of it on my hands, subsequently rubbed it into my shirt, and I eventually put the bottle in my garage — with the garage door open. Highly concentrated anise. 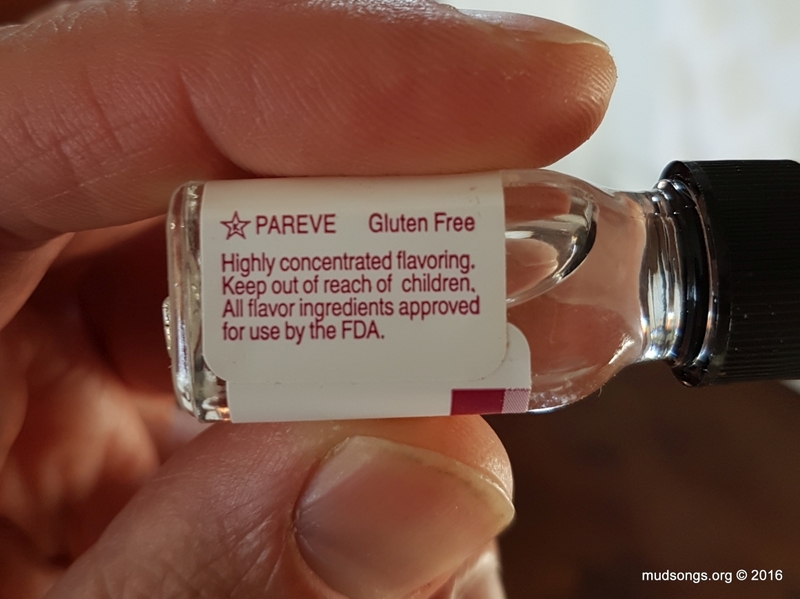 And gluten free! Holy mackerel, what a difference between anise extract and anise oil. I’ve never seen the bees go so completely insane over an aroma. Every drop of syrup I spilled on the ground while I was filling the feeders attracted a mini-cluster of bees. I had bees following me around persistently, attracted by the anise. And the tiny bottle of anise oil that I left in my garage attracted about 20 or so bees. I went into the garage to get something about an hour later and the place sounded like the inside of a bee hive with bees bouncing off the windows trying to get out. And they were still coming through the door when I got there. The stick I used to stir the syrup mixture was left in my little outdoor bee shed, and that was full of bees too. I’ve never had anything like that happen when I used anise extract. 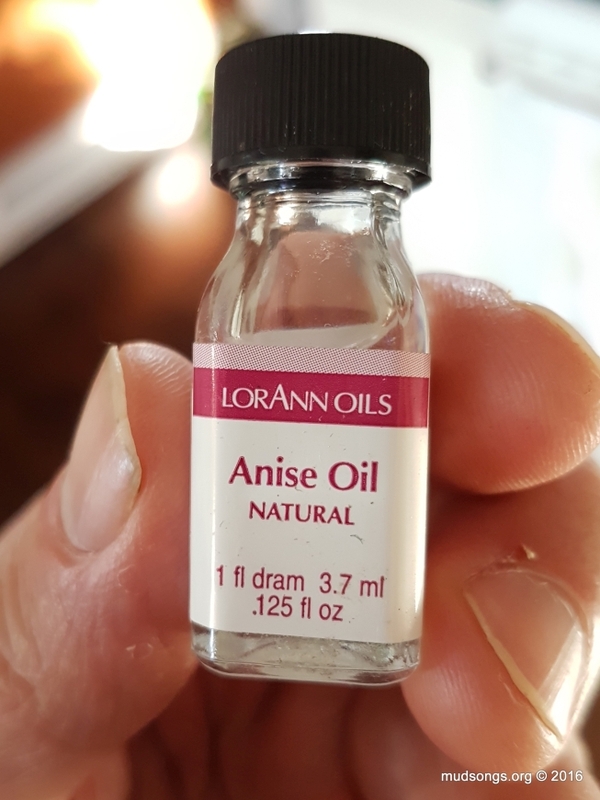 The next time I use highly concentrated anise oil, I’ll be careful to use only a single drop of it and then put it away in the house where the bees can’t smell it. 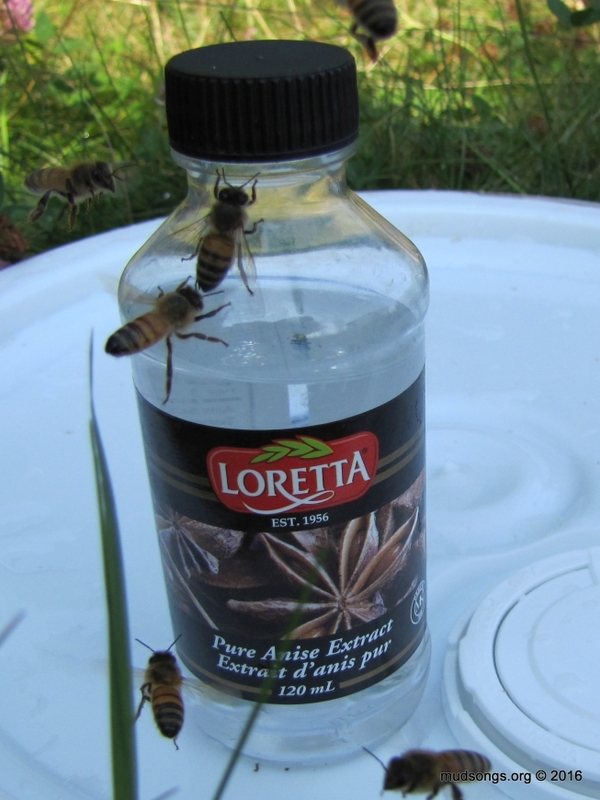 Here’s a demonstration of my quick and easy method of mixing sugar syrup for honey bees. I’m posting it because I keep hearing from people who do things like boil up a syrup mixture on their stove tops at home. That’s a big bag of crazy beans if you ask me, much more time-consuming and complicated than it needs to be. Probably a great way to make a mess of one’s kitchen too. I don’t measure anything. I fill a bucket about half way with white granulated sugar (not raw sugar or anything with a high ash content). I add a drop or two of anise extract to get the bees interested in the syrup. (It’s important to note the difference between anise extract and anise oil.) I add water from a garden house until the bucket is almost full. Then I mix it with a stick for about five minutes until the sugar is dissolved. The result is a thin syrup that works for spring feedings. I add more sugar if I want to make a thick syrup for fall feedings. How can I tell when it’s a thick syrup? Because it’s thick. Thin syrup (1 part sugar, 1 part water) more or less has the consistency of water. Thick syrup (2 parts sugar, 1 part water) takes on a goopey appearance. It sounds goopey. I know that doesn’t seem very precise, but I don’t think a precise syrup mixture matters much to the bees. Sometimes I add about a teaspoon of apple cider vinegar to help prevent the syrup from going moldy, though I can count on one hand how many times I’ve bothered with that. Sometimes I put the syrup aside for a day or two so any left over sugar is more likely to dissolve, but even if some undissolved sugar settles to the bottom of the bucket, is that a problem? I don’t think so. Sometimes the temperature of the water in the hose is warm from being in the sun, though most of the time it’s cold and that works out okay too. While I understand the reason for boiling up sugar syrup and using precise weights and measures in the recipe, and I respect that, I’m just putting it out there that nothing really bad happens when the process is simplified by dumping sugar and water in a bucket and mixing it with a stick. I installed a 4-frame nuc on July 17th, using frames of bare foundation to fill in the remaining frames. On Day 6 I replaced most of the bare foundation with drawn comb because I wanted the queen to have immediate space to lay and expand the brood nest. Today, Day 11, I topped up the frame feeder and noticed bees covering most of the frames in the hive. Click the image to see a better view of the all the bees on the frames. I didn’t pull the frames to see exactly what was going on, and I didn’t really need to because seeing the bees working all the frames is a good enough sign to me that the colony is expanding. 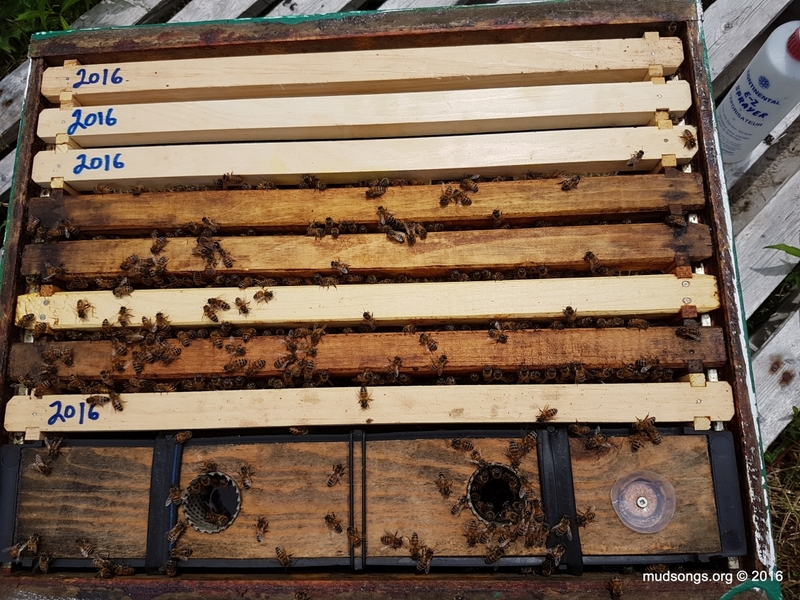 Since I installed the nuc, other than removing the bare foundation, I’ve topped up the frame feeder a few times and I’ve I inserted empty drawn comb between frames of brood to encourage the queen to lay there and expand the brood nest faster. I will continue to do that as the colony expands for the next month or so. The next time I refill the feeder (in four or five days), if I find all the frames are either full of brood or full of syrup and nectar (i.e., the queen doesn’t have much more space to lay), then I’ll add a second deep to the hive. I’ll pull up some brood into the second deep, move the feeder to the second deep, insert plenty of drawn comb for the queen to lay, and I’ll probably steal some frames of brood from one of my stronger colonies to give the nuc colony a boost. The sunny weather doesn’t hurt. P.S. : If I was using bare foundation, I might not add a second deep until the middle of August. It can be a different story in warmer parts of Newfoundland. But that’s not the story I’m telling here. UPDATE: Some unplanned beekeeping happened today. I pulled three frames of brood from a big colony with about 15 frames of capped and open brood and I had little choice but to add them to this nuc hive in a second deep. So this itty bitty nuc hive now has a second deep on top of it with a frame feeder, several frames of drawn comb and three frames of capped and open brood and the nurse bees to go with it — and a big thick heavy frame full of pollen. Hopefully the nurse bees won’t fight with their new queen and everything will work out fine. I’ve never transferred that much brood to a nuc before. I installed three nucs six days ago. 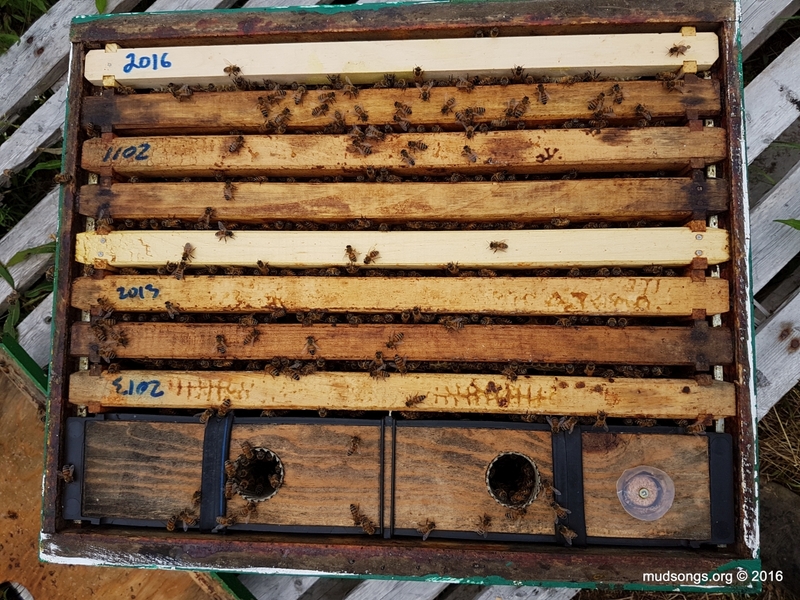 Each nuc contained a frame of capped brood, a frame with bare foundation, and two frames with a mix of empty comb, pollen and honey (and maybe some small patches of brood). Each nuc was installed in a standard 10-frame Langstroth deep super with a frame feeder full of thin sugar syrup spiked with anise extract. The frames were placed in the deep in the same order and orientation as they were in the nuc box. I used frames of drawn comb to fill up two of the nuc hives and bare foundation in the other. I recorded a video of me installing the bare foundation nuc because most new Newfoundland beekeepers will probably begin their first nucs with bare foundation, not drawn comb. My intention was to provide an ongoing and honest record of what new beekeepers in Newfoundland are likely to experience during their first year of establishing a colony from a nuc. But what I found in that nuc hive today has compelled me to change my plans. 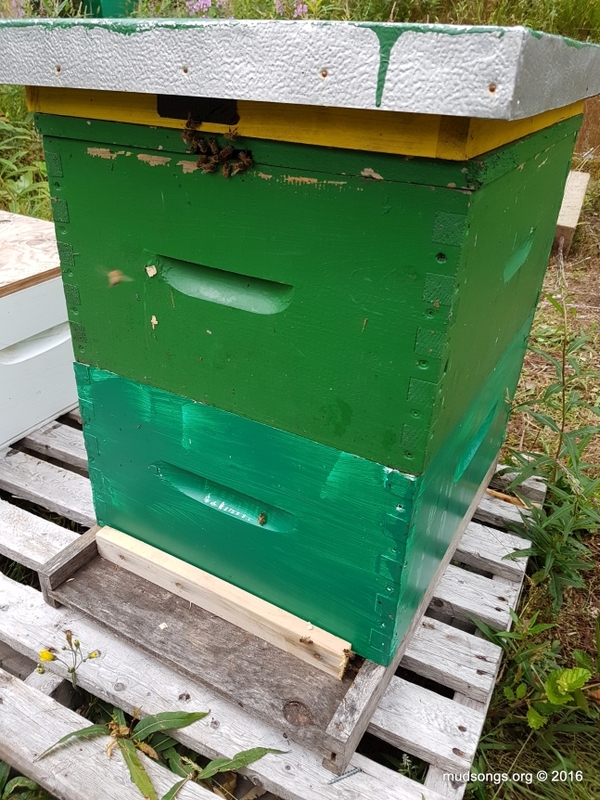 I removed the top three frames of bare foundation from the nuc hive (as shown in the above photo) and replaced them with drawn comb. (The frame closest to the feeder was already full of new comb and syrup, so I left it alone.) Now the queen will have free reign to start laying immediately. She won’t need to wait for the worker bees to build comb over the bare foundation first.